Easy Photo Effects is probably the most easy to use photo editor you will ever find. With just a click on a button you can convert your images into black & white artworks, give them a vintage sepia look or apply a cool movie effect. Each effect can be tweaked and you can combine different effects for an unique look. Version 2.0 is available but the app is no longer portable. 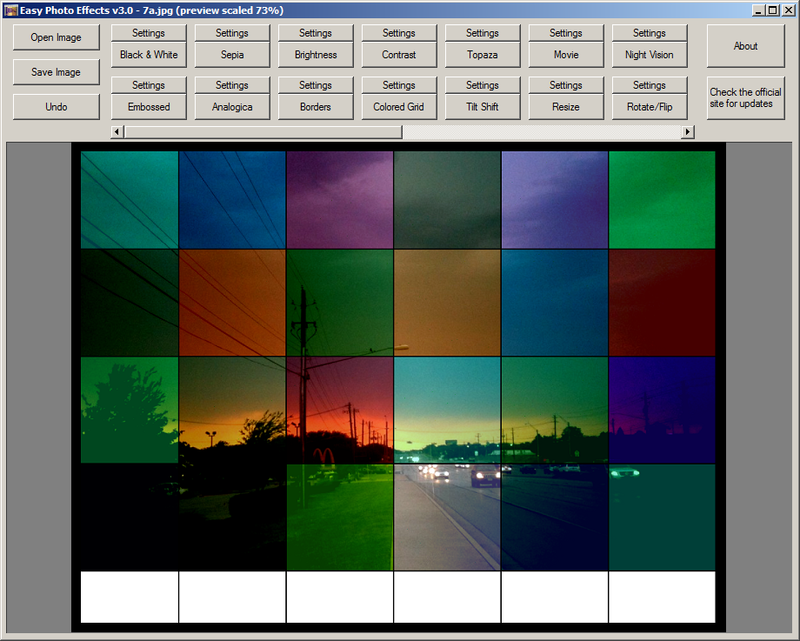 v2.0 - 4 November 2011: Multiple language support (Spanish, English, Dutch), Night Vision, Rotate, stores users settings, enter closes progress window. The seetings are saved to EasyPhotoEffects folder in the %appdata% directory. Topic update: Easy Photo Effects is at v3.0, dated 2013-06-01 (changelog at http://www.easyphotoeffects.com/history.php). @webfork, I am Baas: didn't test, but I find a topic move to "Non Portable" is advisable. Version info should also be removed from OP. Thanks. Note that the program itself still works great on Win7x86 and has a lot of easy-to-use tools that are excellent if you often run the same operations on your graphics over and over (e.g. convert to black and white, add a border, rotate, etc.). Saves to PNG, JPG, and BMP. Status: not portable. Still writes to AppData. I missed that when you posted the first, time. All set.